Has The Walking Dead become just about who is going to die next? In the last episode, “Coda” Beth (Emily Kinney) was killed off in what I thought of as a senseless death. Now in the very next episode Tyreese (Chad L. Coleman) is killed even more senselessly. Senseless death is a part of real life so it stands to reason that it would happen in The Walking Dead. However, Tyreese’s death seemed little more than to shock the audience than to serve the overall story. 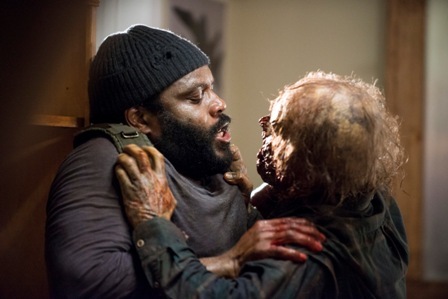 On The Talking Dead, Coleman and makeup effects artist Greg Nicotero – who also directed this episode – suggested that Tyreese had “done all that he could do.” I’m not buying it. How do we know when we’ve done all that we can do in life. 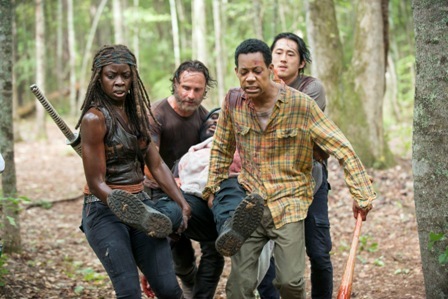 You can’t tell me the others aren’t going to get in some situation where they’re going to be saying, “It would sure be nice if Tyreese was here.” Maybe they just ran out of ideas for Tyreese and wrote him off the show in a ratings grab. Personally I don’t think Tyreese’s full potential was explored on the show. That aside, I can appreciate that they tried to portray the personal side of his death. I liked the yin and yang of his dying hallucinations. He sees the good, Beth and Bob (Lawrence Gilliard Jr.), and the bad, The Governor (David Morrissey) and Martin (Chris Coy). He also sees the two little girls Lizzie (Brighton Sharbino) and Mika (Kyla Kenedy) who tell him they are finally happy in the afterlife (and apparently continue to age, as Mika is now unrecognizable). I can’t help but think the message of this episode is that life in the zombie-apocalypse is not worth living. At the very least it looks like the survivors will finally be leaving Georgia.